At Southwood Financial Planning we are continually making a conscious effort to reduce our carbon footprint and strive to support our local community. Many of you already know that we are proud sponsors of the Sparrow Society, whose mission is to “Change the world one really cool product at a time” by providing the skills training and creating opportunities for their Creators to earn a livable wage. This year we partnered with Greenpop, a Cape Town based NGO, to contribute towards conserving and restoring ecosystems across Sub-Saharan Africa. Greenpop’s work includes planting trees and vegetation in urban greening and reforestation projects and, to date, they have planted over 100,000 trees. Why did we choose Greenpop? At Southwood Financial Planning we use quite a lot of paper, and while we are continuously making a conscious effort to reduce our paper usage, we cannot eliminate paper completely. By supporting Greenpop each month our aim is to balance out our paper usage with the number of trees that have been planted by Greenpop’s reforestation projects. We are proud to be sponsors of such an incredible organisation. By donating to Greenpop each month we support Greenpop’s projects like the reforestation of the Garden Route which started in June this year. This June, Greenpop began their work on the Garden Route with three weeks of environmental action. Collectively, they cleared 5,500m² of alien vegetation at Goukamma Nature Reserve, and planted a total of 4,303 indigenous trees. Of these trees, their reforestation efforts saw 500 planted at Phantom Forest Reserve, 1,680 at the Heartland School of Self-Sufficiency and 1,600 at Featherbed Nature Reserve near Knysna. They also planted at eight urban sites, using more established trees to create windbreaks and buffer zones. In total, they planted 400 trees at Raphaeli Waldorf School in Plettenberg Bay, 22 at Conville Primary School in George, 10 at Eyethu Educare in Knysna, 11 at Touwsranten Park, and 100 at Peace of Eden. 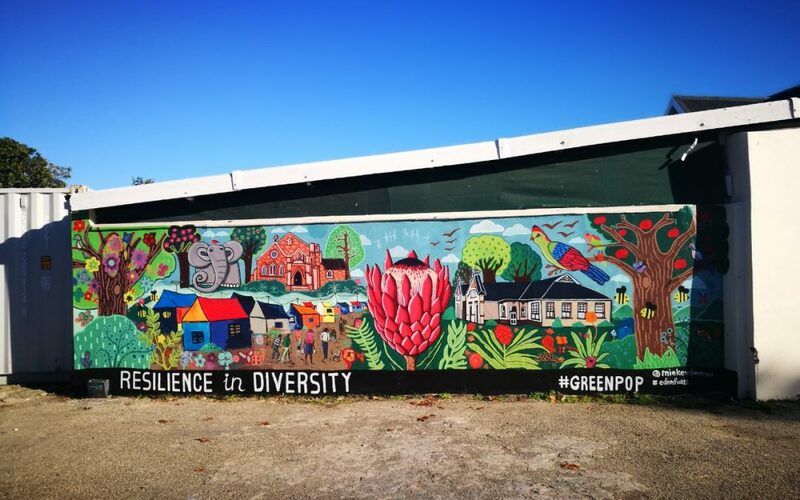 Three collaborative environmental murals were painted, headed up by University of Stellenbosch art lecturer Mieke van der Merwe and local Knysna artist Artwell Musungate, which saw a total of 55m² of urban space painted. The mural locations included Masizame Child and Youth Centre in Kwanokuthula, Knysna’s town hall, and the Touwsranten taxi rank.